In early June 2014 Intercer celebrated 17 years of activity! 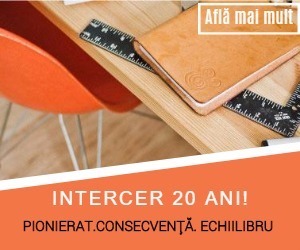 Intercer started as the first created Romanian Adventist website, and today Intercer has a network of biblical websites continuing to be the most popular Romanian Adventist website, with a monthly average of 60,000 unique visitors. Intercer activity started from zero in 1997. In 1996 I was my local church host for Net’96 satellite seminar and I found out about the „It Is Written” Adventist website (iiw.org). Then I was able to visit it for the first time in 1997, after an internet connection was introduced at our work. Then I managed to access the Internet from friends and later from home. At that time, dial-up was quite expensive for an individual user. By the way, my wife Rozalia was baptised in 1996 after Net’96 series. In the summer of 1997 we began the creation of the first Romanian Adventist website at the time. This was the website for the Seventh-day Adventist Church in my home town of Slobozia, Ialomita, Romania. The idea of creating an Adventist website came when I read the article „Internet & the Gospel” by Octavian Lupu. Then we continued our activity through our newly created Intercer Non-Profit Organization, known also as Intercer. „Intercer” is a short for „Internet to Heaven”. We did not get any salary for the first 12 years of our activity. We received donations, but these were not enough to support the ministry expenses. So we also personally contributed to cover all ministry expenses, including paying third-party providers and so on. Since 2009 we try to build a self-supporting system to allow us to continue to maintain and develop new features for our websites. But it’s not easy through these tough times, and we only got a partial salary since 2009. If it wasn’t for our continuing volunteering, the ministry would have stopped long time ago. 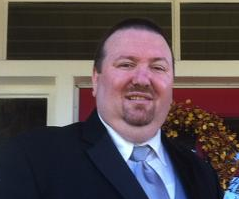 Read how you can support Intercer ministry or go to Intercer Donations page . Read our appeal: „Please pray for our Intercer Ministry to not close down„. We want to thank God for His help all these years. Also we want to say „Thank you!” to our co-workers, sponsors, collaborators and website visitors! 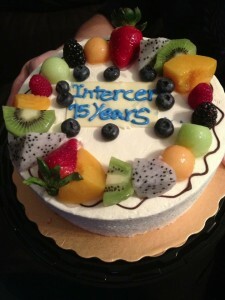 Read the Intercer 15 Years Anniversary Interview & Transcript. 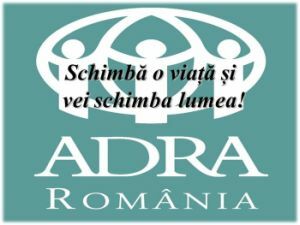 Intercer Romania is a Non-Profit Association composed of Seventh-day Adventist Church members in Romania and abroad. Intercer Canada (International Christian Education & Relief Society) is our similar Non-Profit Organization in Canada. The two organizations work together to support the objectives underlined below. Intercer Ministry Objectives: The purpose of Intercer Ministry is to promote a system of information and materials based on the Christian & humanitarian principles, contributing to programs of interest for children, youth and adults and fighting for a culture of health, morality and good understanding in society. 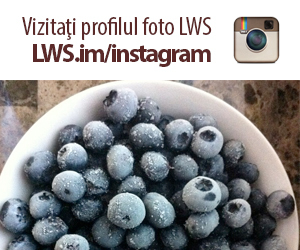 These materials are promoted through all media: Internet, printed materials, video, audio, radio and TV. Intercer runs voluntary activities, providing many Internet services, and social activities. Intercer Ministry Provides: Cornilescu Romanian Bible (text and audio), the Bible for mobile phone (biblephone.net), various studies and biblical materials, E.G. WHITE writings in Romanian, current Adventist news from Romania & around the world, email newsletters sent both to Adventists and non-Adventists, children and youth materials and magazines, Christian music, audio-video, radio and TV, interactive bible quizzes, a prayer request page, photos, PHP & MySQL free courses, forum, chat, guest book, classifieds, a mobile app, advertising services and more. Intercer hosts and / or supports the internet presence of many Romanian Adventist websites. Intercer Stats: Intercer has now a network of biblical websites and continues to be the most popular Romanian Seventh-day Adventist website, with a monthly average of 60,000 unique visitors. Our most visited section is Intercer Tv, which provides every week various Adventist Church audio-video programs, from Romania and diaspora. Intercer TV continues to be the most visited section of our website. The Romanian MP3 Audio Bible also is among the most downloaded materials on our website. Intercer helps promoting various programs and events for the Adventist Church and other social activities. We are glad that our Bible & spiritual material presentations are downloaded often and we were able to contact a large number of people. Intercer managed to integrate young people in Gospel related online activities. Intercer mediated hundreds of social and health cases, resulting in resolving or improving these people’s situation. We receive positive messages from our website visitors. They appreciate the richness of biblical resources and audio-video sermons made available for free. We have a 56% overall returning visitors rate and 30% returning visitors on our English website. Intercer pioneered many web activities for the Adventist Church, being among the first Romanian Christian websites at the time. Intercer is a role-model in presenting different Christian materials and ideas on the internet. We work in good collaboration with various local church organizations and ministries from Romania & other European countries, US (Simpleupdates, Plusline, AdventSource, TagNet, Amazing Facts, It is Written) & Canada ( BC Conference). * We relaunched Intercer English website (en.intercer.net) under the new name „Intercer Adventist News” . Intercer Adventist News provides selected news & media feeds. If you have an RSS feed with your church website news, let us know and we will promote it on our website! * … More in 2014 and beyond! Intercer work is supported by donations and sponsorship’s from individuals and various organizations. 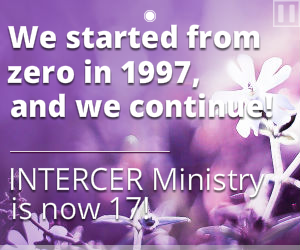 Visit Intercer Ministry donations page at: https://intercer.ca/donations (English language) or http://intercer.net/donatii (Romanian language). We provide a non tax-deductible receipt for all donations received in Canada, and a sponsorship contract or a receipt for all donations received in Romania. A tax-deductible receipt is available for our US donors, if you donate for Intercer project through our US partner organization – Symposia Community Bookstore INC.